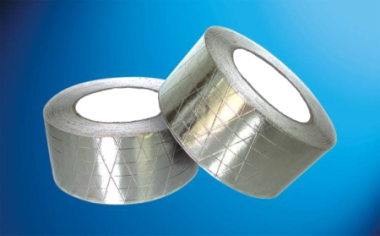 A range of high quality aluminium foil tapes for a variety of insulation applications, most commonly used in the building and construction industry. There is a choice of adhesives, either hot melt for maximum adhesion but limited temperature resistance, or pure acrylic with superior temperature performance. Some grades are supplied on a liner, others are available self-wound (without a liner). A reinforced aluminium foil tape. The tape is based on a 7 micron aluminium foil, reinforced with a 3 way fibreglass scrim kraft, and with a water based acrylic adhesive. It is a self-adhesive tape.